If you've been into this genre for quite a while, you know that a new release in the PuppetShow series is kind of a big deal. This series in known for its thrilling stories and realistic-in-a-creepy-way graphics. And now, the fans of games like that get to experience it again in PuppetShow: The Face of Humanity Collector's Edition. The bonus chapter tells you the story of two of the main characters, David and Hannah. This game just like the other ones befor it features a lot of human-looking puppets. And we know how clowns and puppets are more of the horror genre in our culture. In this release, you are going to find yourself in the town of Saltsbruck, where some of the citizens have been replaced with their puppet versions at their jobs. The frustration of the citizens becomes even worse when several people get murdered and the mayor's daughter is gone missing. This is where you step in as aparanormal investigator and try to solve who is behind all that. It is not easy because you will have to be able to tell the real person from the puppet and avoid the red-eyed monster. The story of the game is excellent and well in the sperit of the series. The bonus chapter tells you the story of two of the main characters, David and Hannah. The graphics are just gorgeous and creepy enough. 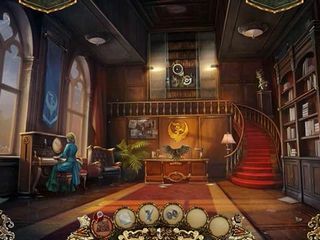 The animation and the music are excellent and create great atmosphere. The game features four modes of difficulty - Casual, Advanced, Hard, and Casual. Hints and skips are as usual adjustable. You also get to choose the gender of your character and whether they are going to be Smart, Brave, or Couth. As you begin to play, a map is provided to you to help you figure out where all you can go. The hiddne object scenes are well done but do lack variety. There really are quite a few kinds of them inthe whole game, but majority ends up to be just lists of items to find. There is no substitute for the HOS in case you are not a fan of them alltogether. 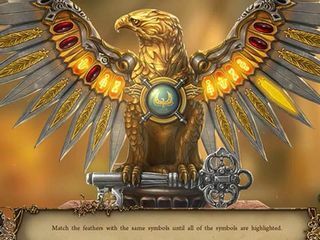 The puzzles are fun and offer both easy and extra difficult ones for the more experienced players. The Collector's Edition extras offer collectibles (unfortunatelly only one through the whole game and no morohing objects), achievements, movies, concept art, soundrtack, replayable HOPs and puzzles. 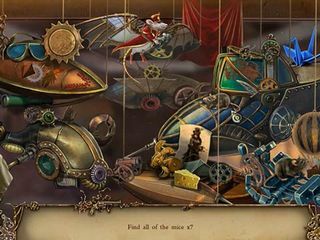 PuppetShow: The Face of Humanity Collector's Edition doesn't offer more innovation in some of its aspects, but sure is one of the best hidden object puzzle advenure games out there. This is PuppetShow: The Face of Humanity review. Download this game here.